Camaria Lehman tells a story about a gorilla born without a leg in the wild. Viewed as a weakling, it was abandoned by its mother. Completely alone and starving, it languished beneath a tree until it finally passed away. Inspired by this true story from the 1930s, Lehman, a rising senior in biomedical engineering and economics, asked the students in the Society of Women Engineers (SWE) Summer Technology and Engineering Program (STEP) to build a hydraulic prosthetic arm for a hypothetical gorilla in need. 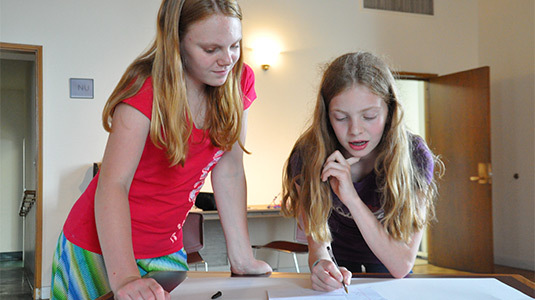 Each summer, Northwestern hosts seventh, eighth, and ninth grade girls for three days of hands-on engineering activities and classroom lessons. They work in small groups with McCormick undergraduate and graduate female engineering students to learn about the different engineering disciplines as well as the career opportunities within each. The free program took place June 16-18 in Evanston. Volunteers from different majors led activities to demonstrate possibilities within their discipline. In a unit dedicated to exploring chemical engineering, the girls discovered that mixing various chemicals together could result in bouncy balls and lipgloss. In a mechanical engineering exercise, they designed and constructed wind turbines. An industrial engineering activity asked them to visit the Lincoln Park Zoo and determine the shortest route for visiting all the animals. Building the prosthetic gorilla arm, however, required several different types of engineering. During the group trip to the zoo, the girls observed the gorillas and took notes about their movement. 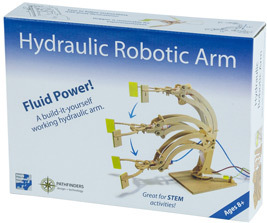 The following day, they built arms from a pre-made hydraulic robot arm kit. The girls were also tasked with managing costs and resources for each project—an important aspect of engineering. “So they really learned the whole scope of what it’s like to be a girl at a university and in the engineering field,” Lehman said.